Plantera en liten chiliplanta direkt till stor kruka! » Chili – Hobbyodling av chilipeppar! 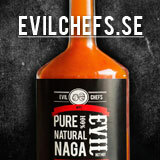 ← Jag lottar ut 10 frön till världens hetaste chilipeppar! Plantera en liten chiliplanta direkt till stor kruka! Of course it is possible to plant a small chiliplanta in a large pot with plenty of Earth. There are a few things that you should keep in mind. A big pot is a lot of water and it is important to water the right way for success. The Earth becomes too wet, the small roots are injured and die plant. Here I use a 20 liter pot. Azomite and Epsom salts (magnesium) and Bat Guano can be found here. See the movie here how I plant a little chili in large pot. 15 Responses to Plantera en liten chiliplanta direkt till stor kruka! Fine plants! Do you top them something, and if so, how many times, or do you let them grow freely? Another question: I have seen that there is little different bat guano, some that are high in nitrogen while others instead is rich in phosphorus. It has to use the COMMUNIST PARTY 2-12-2? Hi and thanks for a very nice blog! I wonder how much pot you would recommend to my chiliplantor that now is about. 10-15 cm high. I have limited space but want them to be as big and strong as possible. Hi! 4 till 10 litre is normal size. There are pots that are a bit narrower and higher, rose pots they take less storage space. The larger the pot you have the larger plants can you get. You must school the step if you have some place indoors and then insert them into the larger pot at midsummer when you can put them in protected mode outdoors. School about them in a 3 – 5 liter pot now as long as. Good idea which saves omskolningar. Did this with my “Dorset Naga Orange”. From plant in coffee mug, In addition to the 30 liter pot of rosjord meal. 2 weeks have passed. Have watered just enough for size of plant. It has got huge blades but not skyrocketed. Should I ask the less bright and help them up. Growing also among several Tennessee Tear drop and Boliwian Rainbow. Prydnadschilin may be that bloom heavily in coffee mugs. Hi! The kind you describe Dorset Naga Orange that actually does not exist, There is only one Dorset Naga and the Red. Grows in this way and it will stretch itself so give it plenty of light and be patient. PS. Dorset Naga is a name protected variety and may not be sold by other than Sea Spring seeds that are sort of the creators and those who obtained the permission of the Sea Spring seeds to sell seeds. Hey Stig. Now it was a while ago that you put the little plant in the large pot, you have no picture you can upload it on now so you can see how it has grown up? Hi Hasse! Currently have fixed a post that shows how the plant developed. Several updates in spring and summer. Have heard that you should remove the first flowers coming to the plant to become more powerful and have more fruits. Is this true! My plants have already flower buds, an even. 6 St. Grateful for answers. Hi! If you have any flowers so don't stop the plant of significantly in growth. Some varieties are beginning to put knob early when they are 10 – 15 cm high and then usually I pick them away to trigger it to grow more. Chilli drops almost always their flowers in the beginning so the plant regulates itself when it is ready for fruit. Do you want a big powerful plant so it's more important that you give the plant a big pot with good soil and even irrigation than picking off flowers. Shake the plant from time to time. You see fruit topics so remove them until you find the plant is big enough. In June, I usually let my flower out to put fruit. Hi. From seed to ripe fruit, it can take anything from 4 till 7 months. Azomite is hard to come by in Sweden but similar is available from Sneckenstroms.se it is called Advantage.